Bethesda, Maryland is adjacent to the northwest border of the District of Columbia. Geologically, Bethesda is located along the fall line boundary of the Appalachian piedmont and the Atlantic Coastal Plain. The terrain in Bethesda is mostly Cambrian and Ordovician, and it becomes Cretaceous toward the east. A Dinosaur Park with fossils of Cretaceous creatures is found between Washington, D.C. and Baltimore. 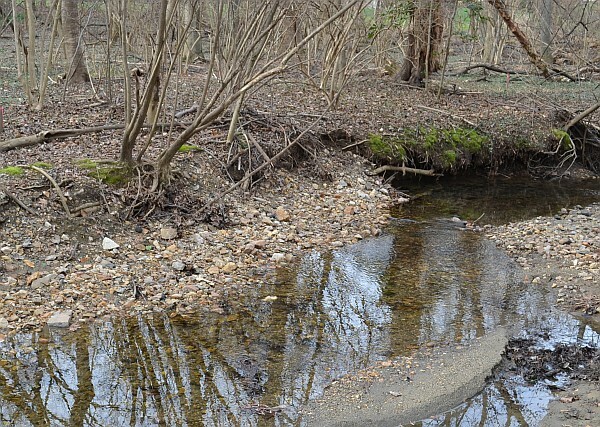 Little Falls Branch is a small tributary stream of the Potomac River, approximately 3.8 miles long (6.1 km) located in Montgomery County, Maryland. 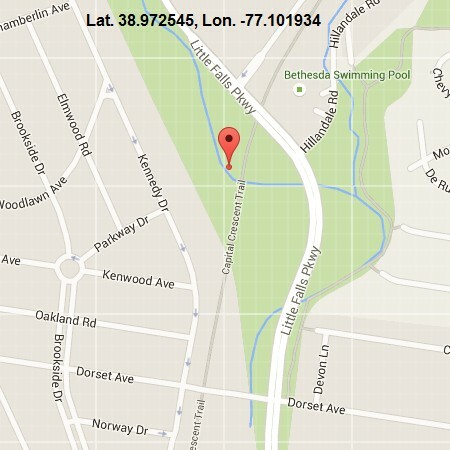 The stream near the intersection of Little Falls Parkway and the Capitol Crescent Trail is easily accessible and exposes the natural bedrock at the coordinates Lat. 38.972545, Lon. -77.101934. The stream was called Powder Mill Branch in the 19th century  and it drains portions of Bethesda, Somerset, Friendship Heights, and the District of Columbia into the Potomac at Little Falls rapids, which marks the upper end of the tidal Potomac. The stream is used for Storm Water Management and the rocky bed has been replaced with a concrete channel in some sections to prevent meandering and flooding of the parklands situated along the banks. 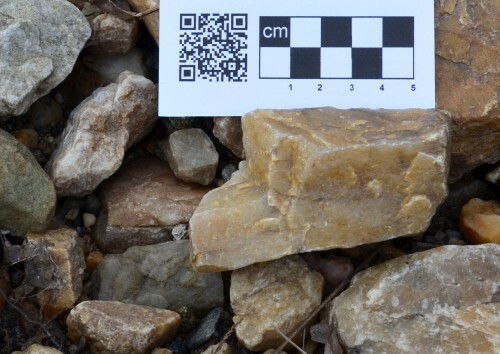 The rocks found in the stream bed have primarily a fine-grained felsic composition with a light beige color consisting of alkali feldspars that incorporate sodium (NaAlSi3O8) and potassium (KAlSi3O8), and plagioclase feldspars that generally incorporate calcium (CaAl2Si2O8). A U.S. Geological Survey map shows that the area from which the sample was taken is of Early Ordovician origin and is composed mainly of quartz gabbro and quartz diorite, mostly medium- to coarse-grained quartz-augite-hornblende metagabbro, lesser quartz diorite, and much lesser quartz norite. The area where the sample was taken is along the Fall Line that demarcates two physiographic provinces in which the geology and climate history have resulted in landforms that are distinctly different. 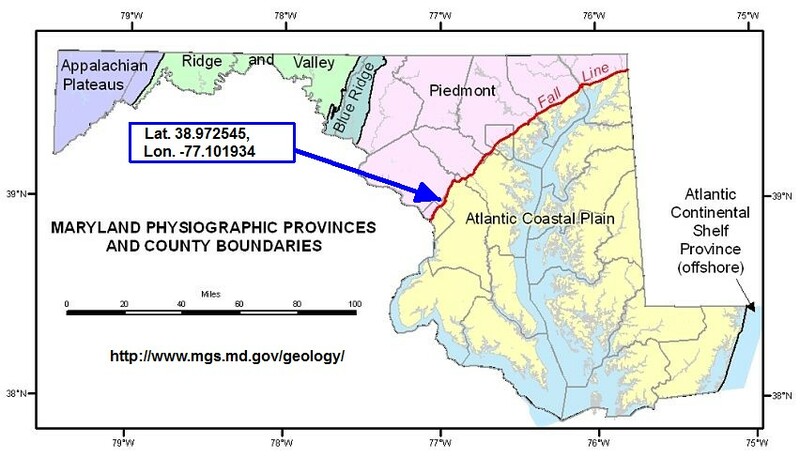 According to the Maryland Geological Survey , the Piedmont Plateau Province is composed of hard, crystalline igneous and metamorphic rocks and extends from the inner edge of the Coastal Plain westward to Catoctin Mountain, the eastern boundary of the Blue Ridge Province. Bedrock in the eastern part of the Piedmont consists of schist, gneiss, gabbro, and other highly metamorphosed sedimentary and igneous rocks of probable volcanic origin. In several places these rocks have been intruded by granitic plutons and pegmatites. Deep drilling has revealed that similar metamorphic and igneous rocks underlie the sedimentary rocks of the Coastal Plain. The Atlantic Coastal Plain Province is a wedge of unconsolidated sediments including gravel, sand, silt, and clay, which overlaps the rocks of the eastern Piedmont along an irregular line of contact known as the Fall Zone. Eastward, this wedge of sediments thickens to more than 8,000 feet at the Atlantic coast line. Beyond this line is the Atlantic Continental Shelf Province, the submerged continuation of the Coastal Plain, which extends eastward for at least another 75 miles where the sediments attain a maximum thickness of about 40,000 feet. Harry C. Ways, "The Washington Aqueduct: 1852-1992." (Baltimore, MD: U.S. Army Corps of Engineers, Baltimore District, 1996).